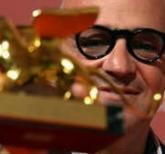 Sacro GRA, directed by Gianfranco Rosi, becomes the first documentary ever to win the Golden Lion. Accepting the award on Saturday, Rosi called it "an incredible honour". Britain's Steve Coogan and Jeff Pope won best screenplay for Philomena, a two-hander between Coogan and Judi Dench, a favourite for the Golden Lion. The film, directed by Stephen Frears, stars Dame Judi in the real-life role of an Irish woman who was forced by nuns to give up her son for adoption, and nearly 50 years later sets off on a journey in search of her son. "Sacro GRA", a pun on the ring road's name which evokes the Italian for Holy Grail, is the first Italian production to win the top award for 15 years. "I didn't expect to win such an important prize with a documentary," said Rosi. "It was truly an act of courage, a barrier has been broken. " Rosi spent two years in a mini-van circling the ring road filming conversations with a cross-section of society that included a count, a paramedic and a botanist tending the thoroughfare's palm trees. He dedicated the prize to the characters in the film "who allowed me to enter in their lives". Rosi's home-grown success comes in a year which saw the jury chaired by veteran Italian director Bernardo Bertolucci, and including Star Wars actress Carrie Fisher and British film-maker Andrea Arnold. "Tonight I saw the maestro [Bertolucci] and he was extremely moved when he gave me the award," said Rosi "and this makes this even more important". "I think that all the jury felt the poetic force of Rosi's film and that's all there is to be said," said Bertolucci, who won a career Golden Lion in 2007. Best actress also went to an Italian, Elena Cotta, for her performance in Emma Dante's A Street in Palermo, a film in which she did not utter a word. The Silver Lion, for best director, went to Greece's Alexandros Avranas for Miss Violence, a disturbing look at sexual violence and abuse perpetrated by a father and grandfather, played by Greek actor Themis Panou, who won the best actor prize. Twenty films featured at the 2013 film festival, which is celebrating its 70th year, including Jonathan Glazer's Under the Skin, with Scarlett Johansson and Terry Gilliam's dark fantasy The Zero Theorem, starring Matt Damon. The 9-day festival opened with Alfonso Cuaron's 3D sci-fi thriller Gravity, starring George Clooney and Sandra Bullock.